The more I think about it, the more racing a Great White Shark seems like something Ryan Lochte would do than something Michael Phelps would do. Featured Image Credit: “Great White Shark” by Elias Levy, via Flickr. Used under a Creative Commons Attribution 2.0 Generic License. Featured Image Credit: “Soundgarden – Oslo Spektrum 2013” by Tom Øverlie/NRK P3, via Flickr. Used under a Creative Commons Attribution-NonCommercial-ShareAlike 2.0 Generic License. If you can get past the puzzle piece jumpsuit visuals and focus on Jones’s singing, it might actually be a contender as a better version than The Beatles. Hearing The Beatles’ version after hearing Jones’s version, it really does feel like the song was written for Tom Jones. 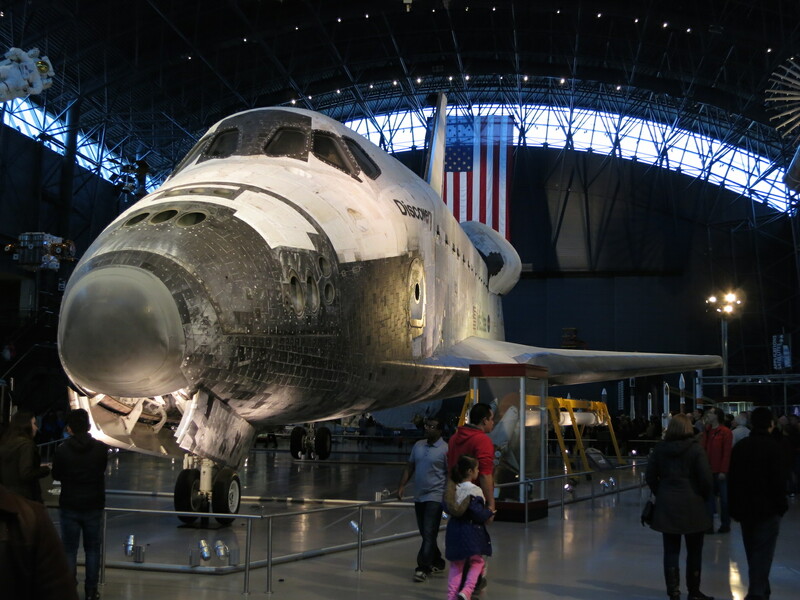 On this date 5 years ago the space shuttle Discovery first went on display at the National Air and Space Museum’s Stephen F. Udvar-Hazy Center, next to Washington Dulles International Airport, following its final spaceflight. It’s imposing to see staring back at you as you walk into the gallery. 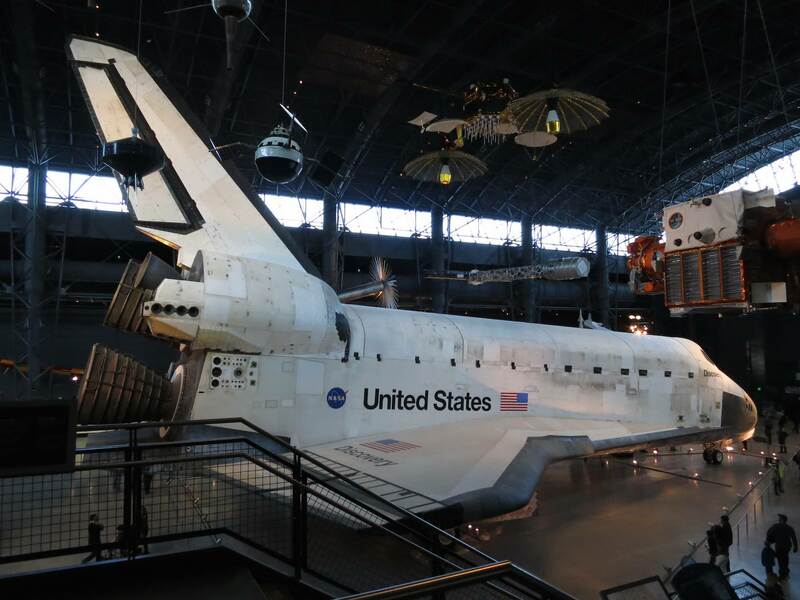 The size of the orbiter is massive, especially when you compare it to every other vehicle that has carried humans into space before or since (most of which have some display version, if not an actual vehicle, either at the Udvar-Hazy Center or at the main facility in Washington, D.C.). 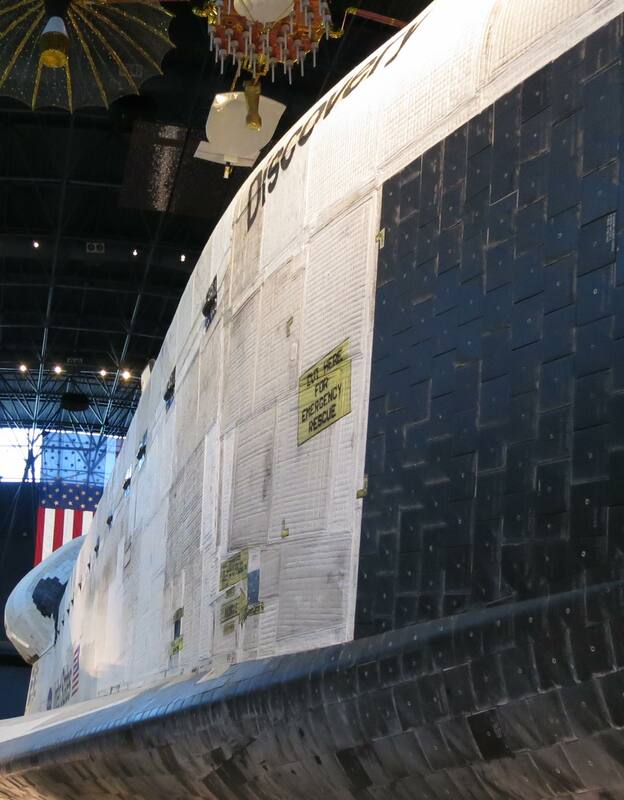 The Smithsonian has preserved Discovery as it was following its final mission, still with scorch marks on the outside from its final reentry. I was surprised to see that a lot of the exterior is covered in fabric; only the black part is ceramic tile. Both provided the same thermal protection performance. These pictures are from my visit this past New Year’s Eve. 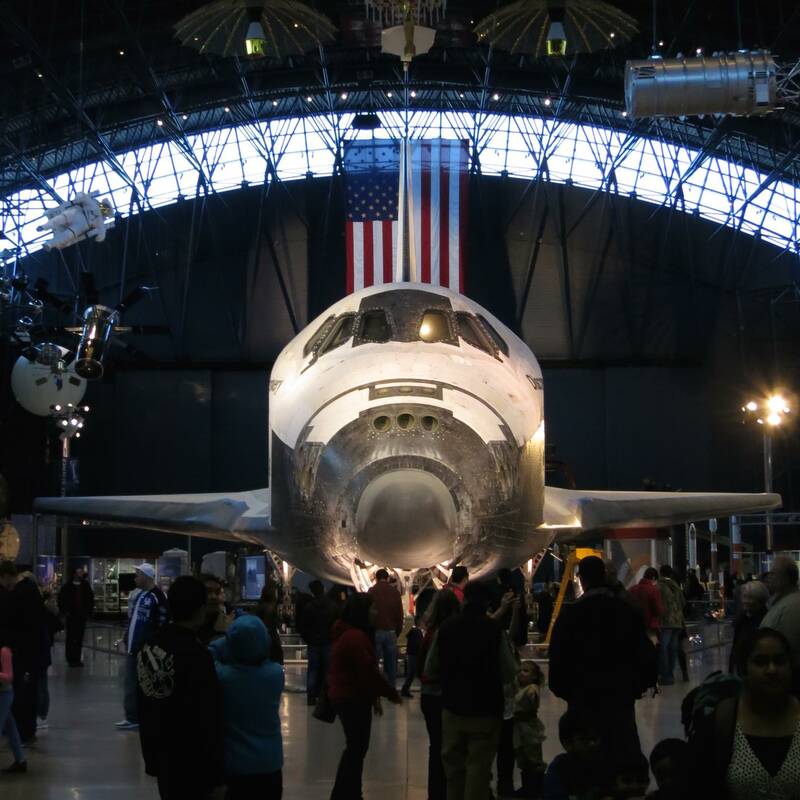 Discovery stares you down as you enter the gallery. It’s not the biggest plane in the building, but it’s nowhere near the smallest. I had to step way back to fit the entire orbiter in this picture. 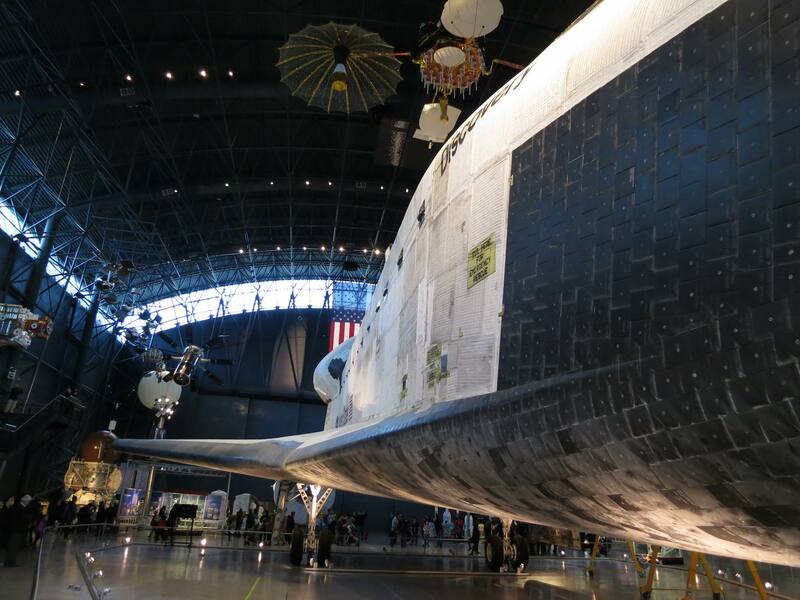 Compare the person standing under the main engines to get a sense of just how huge Discovery is! These are some of the maneuvering motors on the nose. 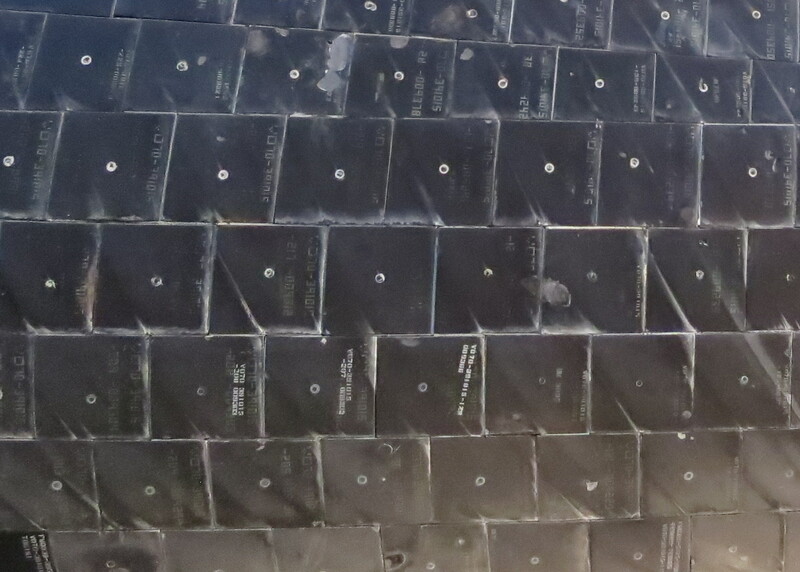 Here’s a full-size crop of the previous photo for a detailed look at the tiles. While capable of withstanding extreme temperatures, they’re actually very fragile and can be broken just by someone touching them. The lining between the tiles is felt, which is the source of most of the scorching you see. Looking down the starboard side of Discovery from my eye level. I’m 6 feet tall (roughly 2 meters), for an idea of the size. This is a full-size crop of the previous image. Notice the difference between the part covered by fabric and the part covered by tile. 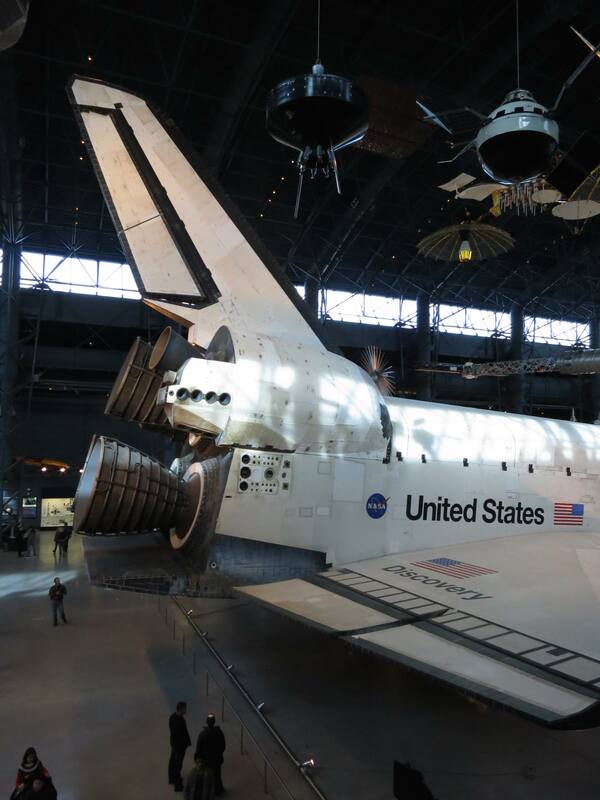 For more on Discovery’s transfer to the Smithsonian I highly recommend the documentary Shuttle Discovery’s Last Mission. It still shows on TV sometimes (I saw it by chance a few weeks ago), or is available on Netflix. This was a fascinating read. I had no idea the Charging Bull statue was an uncommissioned guerrilla artwork. I always assumed an investment firm or trade group had commissioned it, but the New York Stock Exchange actually had the New York Police Department impound the statute when it first appeared outside their building. I also didn’t know the Fearless Girl statue was commissioned by an investment firm as a bit of guerrilla marketing. But I can understand why Charging Bull’s artist doesn’t like Fearless Girl: it changes his symbol of power and strength into a symbol of oppression, all to sell somebody’s stock portfolio. I also find it ironic that the company behind Fearless Girl would turn a symbol of “strength in the market” into a symbol of oppression when the product they sell their clients is strength in the market. Maybe a more apt placement would be to put the Fearless Girl next to the bull, facing in the same direction, as though she was directing the Charging Bull. That would probably square better with what State Street Global is selling, and it would return Charging Bull to a symbol of strength, not oppression. I’ve gotten a little annoyed by the sound of a neighbor kid dribbling and shooting a basketball for the past few hours, and I feel pretty stupid for that bugging me. Why is it stupid? Because by the time I go to bed tonight I’ll have watched something like 32 hours of college basketball over the past 4 days. The NCAA Division I Men’s Basketball Championship is underway, and March Madness is my favorite time of the year. College basketball is my favorite sport. So why does the neighbor kid dribbling and shooting baskets for a couple hours start to get annoying? Maybe someday those hours of practice will pay off and I’ll be watching him play in the big dance! Friendship 7, on display at the National Air & Space Museum in Washington, D.C.
On this date 55 years ago, John Glenn became the first American to orbit the Earth, flying in his Mercury capsule named Friendship 7. 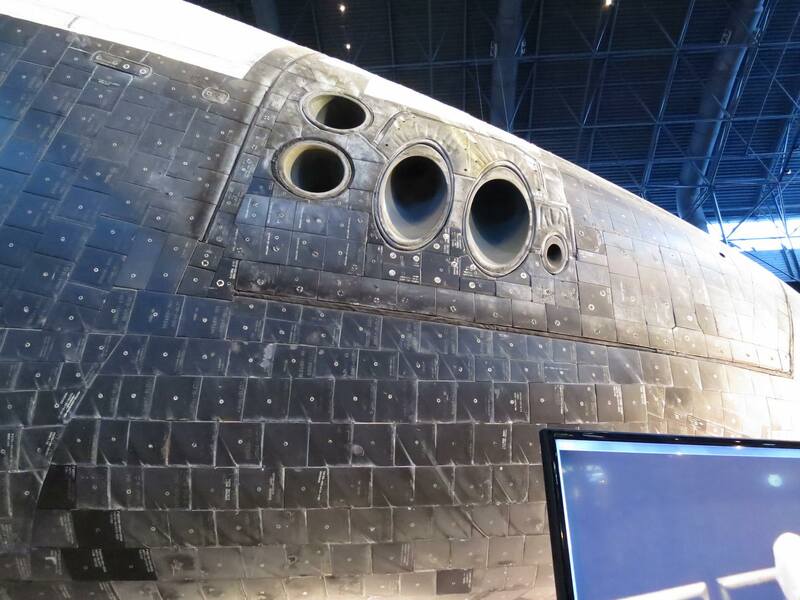 I got to see this in person this past December at the National Air & Space Museum. I’d always read about how small they were, but you have to see it to believe it. This thing could easily fit in the back of most minivans! There was a largely unseen army of people supporting Glenn, but it still took a lot of guts to strap into this new vehicle and take it where no one had gone before. 48 states, eh? Obviously they skipped Alaska and Hawaii. Someday I want to do a 48 state road trip that includes Alaska and excludes some random state in the lower 48.